Some of the country’s best snowmobiling trails have nestled their way into the hills and mountains of the East Coast. We’ve compiled five of our favorites so you can gather your family and friends and hit the powder, even this late in the season. Northern Maine is home to over 2,300 miles of snowmobiling trails, but some of the best interconnected trails exist in The County, Maine — the northern most county in the contiguous United States. With snowy trails well into April, you can head out east over Spring Break and catch hundreds of miles of riding time on the beautiful slopes and valleys of Aroostok County. Start out in Bretton Woods and make your way through the White Mountains, visiting Mount Washington, the highest peak in this range. You can zip in and out of woodlands, and stop by a number of charming New Hampshire mountain towns when you need a quick cup of cocoa and a place to warm up. Join up with a rental company or hit the trails solo in the Northern Kingdom of Vermont. The Northern Kingdom is the epicenter of snowmobiling in the state and features over 5,000 miles of well-groomed trails. Ride through pristine landscapes of the east coast, through woodlands and over ponds, and don’t forget your camera! You might seem some moose along the way. One of the most unique snowmobiling destinations is located in Eagle Lake, Maine. 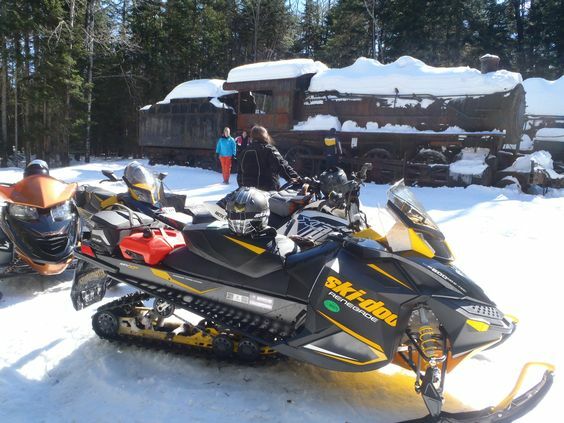 Take your snowmobile out along the nearly uncharted territory in search of the abandoned locomotives in Piscataquis County just off the shore of Eagle Lake. For overnight trips, the area has a host of cabins located situated around the frozen lake, but far away from other civilization, giving you the perfect weekend getaway. Start a new family tradition by taking your family out snowmobiling in the Pocono Mountains. Open snowmobiling trails are shorter than the rugged 1,000 miles of terrain you might find elsewhere, but you’ll be enchanted with the wide-open fields, crisp mountain streams, and fresh smell of pinewood nonetheless. 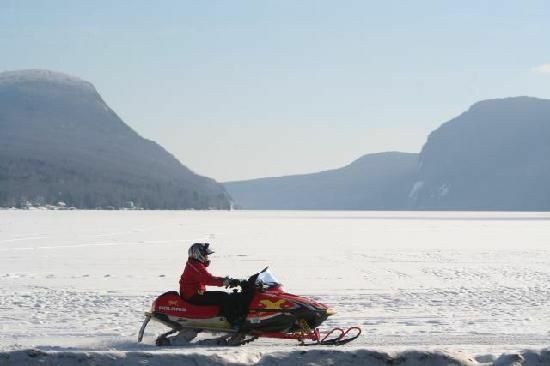 Renting snowmobiles is no issue in the Pocono Mountains– with resorts spotted through town, you can find many that offer all-inclusive stays, including your own snowmobile and private trails just for guests.